Definition at line 16 of file CMathTrigger.h. Definition at line 14 of file CMathTrigger.cpp. Definition at line 26 of file CMathTrigger.cpp. Definition at line 39 of file CMathTrigger.cpp. Definition at line 141 of file CMathTrigger.cpp. Determine the truth value for the initial conditions. Definition at line 147 of file CMathTrigger.cpp. Definition at line 51 of file CMathTrigger.cpp. Determine whether the root only changes during discrete events. The root must be compiled before calling this method. Definition at line 60 of file CMathTrigger.cpp. Retrieve a pointer to the current value of the root. Definition at line 160 of file CMathTrigger.cpp. Definition at line 80 of file CMathTrigger.cpp. References CCopasiNode< _Data >::addChild(), CEvaluationNodeNumber::DOUBLE, and CEvaluationNodeLogical::GT. 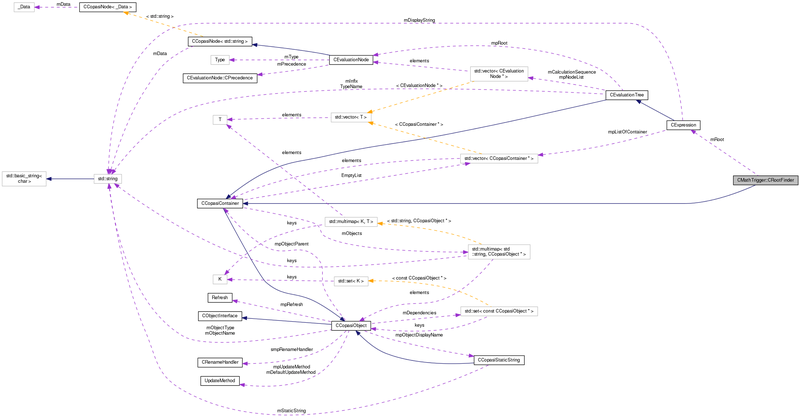 Referenced by CMathTrigger::compileGE(), CMathTrigger::compileGT(), CMathTrigger::compileLE(), and CMathTrigger::compileLT(). Initialize the contained object references. Definition at line 42 of file CMathTrigger.cpp. 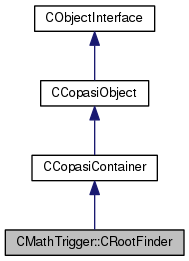 References CCopasiObject::addDirectDependency(), C_FLOAT64, CExpression::refresh(), and CCopasiObject::setRefresh(). Check whether the root change only during discrete events. Definition at line 65 of file CMathTrigger.cpp. Check whether the root is checked for equality. Definition at line 70 of file CMathTrigger.cpp. Check whether the root's current state is true . Definition at line 75 of file CMathTrigger.cpp. Definition at line 91 of file CMathTrigger.cpp. Definition at line 129 of file CMathTrigger.cpp. Definition at line 18 of file CMathTrigger.h. Definition at line 136 of file CMathTrigger.h. Definition at line 131 of file CMathTrigger.h. Definition at line 147 of file CMathTrigger.h. Definition at line 126 of file CMathTrigger.h. Definition at line 121 of file CMathTrigger.h. Definition at line 142 of file CMathTrigger.h.